A federal judge in New York has issued an emergency stay temporarily stopping the removal of individuals detained at the airports after President Trump's order banned immigrants from seven Muslim-majority countries from entering the U.S. The move marks the first successful legal challenge against the Trump administration and affects those who have arrived in the U.S. already or were in transit with valid visas. The court ruled on a habeas corpus petition filed by the American Civil Liberties Union (ACLU) on behalf of two Iraqi men who were detained at John F. Kennedy International Airport on Friday after Trump's ban. Since then both men, Hameed Khalid Darweesh and Sameer Abdulkhaleq Alshaw, have been granted entry into the U.S. The ruling deals with a part of Trump's order which bars Syrian refugees indefinitely and halts the resettlement of all refugees for four months as the administration reviews the vetting process. Judge Ann Donnelly of the U.S. District Court in Brooklyn granted the request from ACLU to stay the deportations after determining that the risk of injury to those detained by being returned to their home countries necessitated the decision. 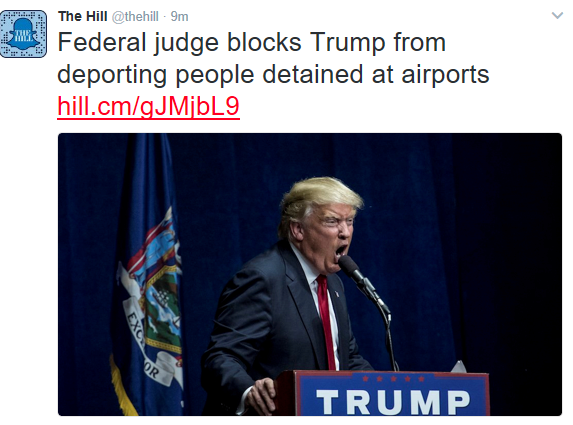 And only minutes after the judge’s ruling in New York, another came in Virginia when U.S. District Judge Leonie Brinkema issued a temporary restraining order to block the removal of any green-card holders being detained at Dulles International Airport for seven days. 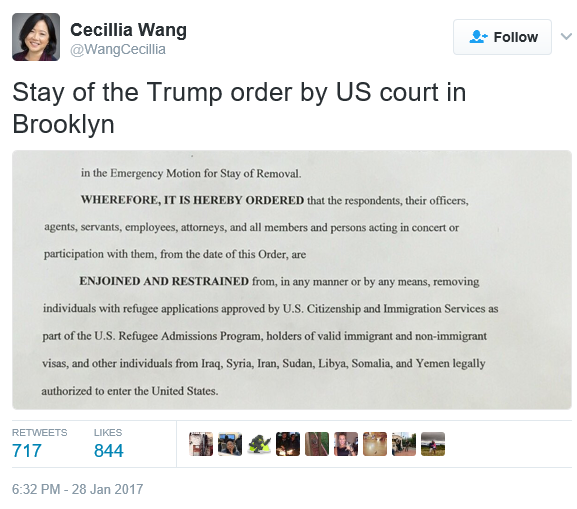 Brinkema’s action also ordered that lawyers have access to those held there because of the president’s ban. There have been several protests at various airports since the ban was announced.